"The Land of Israel for the People of Israel" / "Tsum Iddishen Folk! ", leaflet published by the English Zionist Federation for a Zionist convention in London, held on December 2, 1917. [London]: Goroditzky Press, 1917. Yiddish and Hebrew. Four-page leaflet printed by the English Zionist Federation for a Zionist convention held in London in December 1917, one month after the Balfour Declaration was issued. Printed on the first page of the leaflet is the text of the Balfour Declaration, in Yiddish and Hebrew. Printed further on in the leaflet is a public appeal by the English Zionist Federation titled "Tsum Iddishen Folk!" [To the Jewish People! 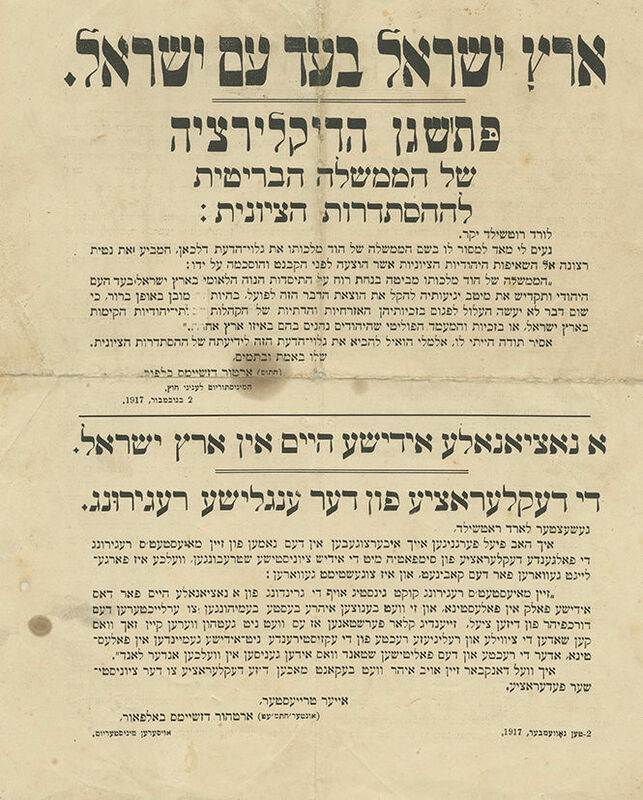 ], signed in print by Chaim Weizmann and Nahum Sokolow. leaves (four printed pages), detached from each other. 26.5 cm. Good-fair condition. Folding marks, creases and minor blemishes. Stains, some dark. Tears (some open), repaired with acid-free tape.